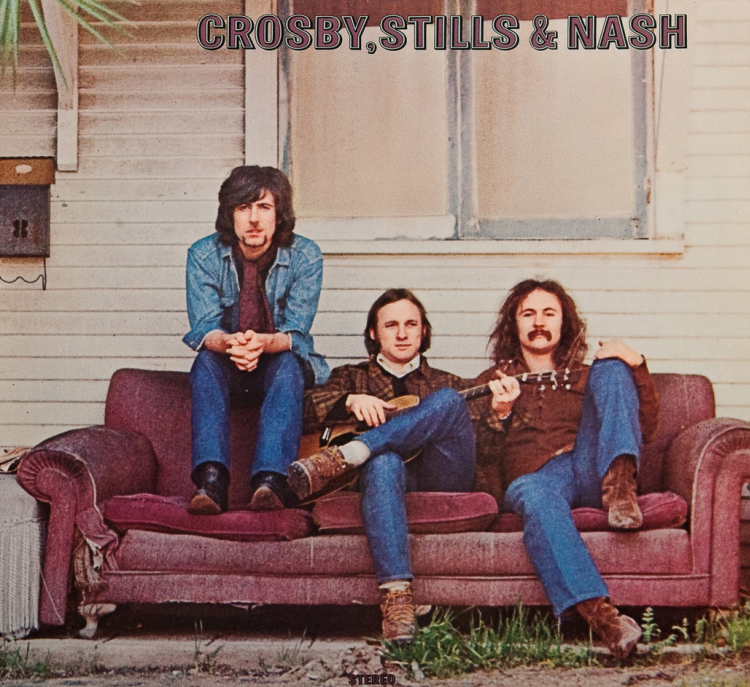 Crosby, Stills & Nash is the first album by Crosby, Stills & Nash, released in 1969 on the Atlantic Records label. It spawned two Top 40 hit singles, “Marrakesh Express” and “Suite: Judy Blue Eyes,” which peaked respectively at #28 the week of August 23, 1969, and at #21 the week of October 25, 1969, on the Billboard Hot 100 singles chart. The album itself peaked at #6 on the Billboard Top Pop Albums chart. The album was a very strong debut for the band, instantly lifting them to stardom. Along with the Byrds’ Sweetheart of the Rodeo and The Band’s Music From Big Pink of the previous year, it helped initiate a sea change in popular music away from the ruling late sixties aesthetic of bands playing blues-based rock music on loud guitars. Crosby, Stills & Nash presented a new wrinkle in building upon rock’s roots, utilizing folk, blues, and even jazz without specifically sounding like mere duplication. Not only blending voices, the three meshed their differing strengths, Crosby for social commentary and atmospheric mood pieces, Stills for his diverse musical skills and for folding folk and country elements subtly into complex rock structures, and Nash for his radio-friendly pop melodies, to create an amalgam of broad appeal. Eventually going multi-platinum, in addition to the above mentioned singles, Crosby, Stills & Nash features some of their best known songs in “Wooden Ships” and “Helplessly Hoping“. “Suite: Judy Blue Eyes” was composed for Judy Collins, and “Long Time Gone” was a response to the assassination of Robert F. Kennedy. ..With the Eastern-tinged modality of its exhilarating folk-rock flair, the opening Suite: Judy Blue Eyes easily set the stage for the rest of Crosby, Stills & Nash’s debut by rallying the outfit’s future fans around its twirling tangle of guitar, bass, and lush three-part harmonies. Drenched in gleeful lysergic buoyancy, the song’s rainbow-hued, multi-part odyssey perfectly encapsulated the free-spirited brightness of the ’60s, and after Nash mumbled a bit of gibberish, the ensemble tumbled into the hashish-stoked journey of Marrakesh Express, quickly making it crystal clear that the group had successfully burned its own DNA into the twisted strands of The Beatles’ Sgt. Pepper’s Lonely Hearts Club Band and Simon & Garfunkel’s Parsley, Sage, Rosemary and Thyme. From Guinevere’s meditative romantic pull to the broiling jazz of Wooden Ships’ ominous, aqueous depiction of Armageddon, the trio’s eponymous effort unquestionably was an Americana-infused masterpiece that not only provided the framework for the Grateful Dead’s twin gems Workingman’s Dead and American Beauty, but also poured the foundation for the careers of America, Loggins & Messina, and The Eagles. On the cover the members are, left to right, Nash, Stills, and Crosby, for no particular reason, the reverse of the order of the album title. The photo was taken by their friend and photographer Henry Diltz before they came up with a name for the group. They found an abandoned house at 815 Palm Avenue, West Hollywood, across from the Santa Palm car wash that they thought would be a perfect fit for their image. A few days later they decided on the name “Crosby, Stills, and Nash”. To prevent confusion, they went back to the house a day or so later to re-shoot the cover in the correct order, but when they got there they found the house had been reduced to a pile of timber. The Crosby, Stills & Nash triumvirate shot to immediate superstardom with the release of its self-titled debut LP, a sparkling set immortalizing the group’s amazingly close, high harmonies. While elements of the record haven’t dated well — Nash’s Eastern-influenced musings on the hit “Marrakesh Express” now seem more than a little silly, while the antiwar sentiments of “Wooden Ships,” though well-intentioned, are rather hokey — the harmonies are absolutely timeless, and the best material remains rock-solid. Stills’ gorgeous opener, “Suite: Judy Blue Eyes,” in particular, is an epic love song remarkable in its musical and emotional intricacy, Nash’s “Pre-Road Downs” is buoyant folk-pop underpinned by light psychedelic textures, and Crosby’s “Long Time Gone” remains a potent indictment of the assassination of Robert Kennedy. A definitive document of its era.